Two days ago the Yankees made their (first?) big move prior to the trade deadline, adding Zach Britton in a deal with the Orioles. Pitching prospects Dillon Tate, Josh Rogers, and Cody Carroll went the other way. Not gonna lie, I held off on putting together this thoughts post because I figured the O’s would drag their feet with the medical reviews. Instead, the trade was finalized rather quickly. Anyway, let’s get to some thoughts. 1. Did the Yankees need another reliever? No. Are the Yankees a better team with Britton? Yes. That’s the whole point, right? In a division race like this — the Yankees are four games back in the loss column with 62 games to play, including ten head-to-head with the Red Sox — any sort of upgrade is worth making. 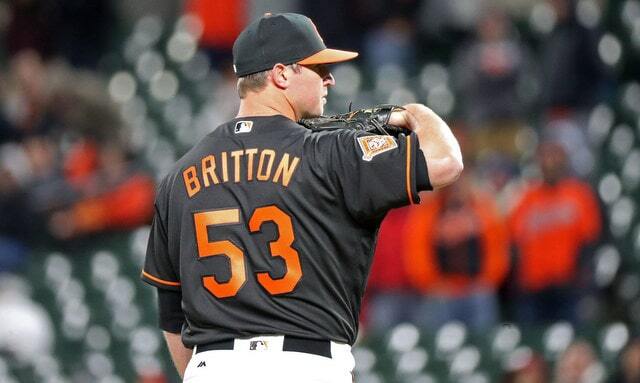 And Britton could be a significant upgrade too. I’ve always felt WAR underrates high-leverage relievers, potentially significantly depending on their usage. ZiPS and Steamer have him at +0.2 WAR and +0.3 WAR, respectively, the rest of the season. That’s his value in the analytical world. In the real world, Britton could add two or three wins to the ledger because he’ll be asked to get big outs in close games, outs that a lesser reliever might not get. Just because the Yankees have a more dire need for a starting pitcher (and a catcher in the wake of Gary Sanchez’s injury) doesn’t mean they should ignore other potential upgrades, which in this case meant making an already very good bullpen even better. The Yankees are a better team and they still have plenty of prospects to trade. A no-brainer move, in my opinion. 2. The Yankees have to make a move to get Britton on the 25-man roster today — they still have an open 40-man roster from the last time they cut David Hale, so that’s easy — and the straightforward move would be dumping Chasen Shreve. That’s who Britton is effectively replacing, right? That would be the easy move. I bet it doesn’t happen. My guess is the Yankees will send Luis Cessa down and roll with a nine-man bullpen for the foreseeable future. That buys them time to possibly trade Shreve (better than losing him for nothing, right?) and also allows them to keep him in case someone gets hurt over the weekend. Monday’s off-day gives the Yankees a lot of flexibility with their rotation. If they trade for a starter, Monday’s off-day allows them to slot him in whenever’s convenient. If they don’t, they can push Cessa’s rotation spot back long enough until Domingo German satisfies the ten-day rule. German makes one start and then Cessa takes over again. Not ideal, but a fallback option. My guess is the Yankees are getting a starter though, so they can stick with the nine-man bullpen until then. We’ll see what happens, but that’s my guess. Cessa goes to Triple-A for Britton later today. 3. So what are the best bullpen roles? Britton said he is willing to pitch in any role for the Yankees — “I think you’ve got to go into a new team and earn your role, especially with the guys they have over there,” he said to Brittany Ghiroli following the trade — so that’s good. It’s not like he has a say in things, but buy-in is important. Aroldis Chapman is locked in as the closer, so that’s easy. In my perfect world Britton and Dellin Betances would share seventh and eighth inning duty, with Betances facing the tough righties and Britton facing the tough lefties as the lineup allows. That would be ideal. I was hoping Joe Girardi would use Betances and Andrew Miller that way in 2016, but it didn’t happen. Betances was the seventh inning guy and Miller was the eighth inning guy. I’d bet on Aaron Boone doing the same thing. One guy works the seventh, the other works the eighth, and that’s fine. I don’t love it, but assigned innings have crushed my soul, so I’m not going to argue anymore. Chapman as closer with Betances and Britton as the seventh and eighth inning guys (in either order) leaves David Robertson, Jonathan Holder, and Chad Green for fireman work, and Adam Warren and A.J. Cole for everything else. That’ll play. I’m tempted to say Boone should use Britton as a double play specialist given his ground ball rate — bring him into a jam and let him get that ground ball to escape the inning — but I’d so much rather have a strikeout pitcher on the mound trying to strand runners. The fewer balls in play, the better. Bullpen roles tend to develop organically. This will all sort itself out. 4. Britton will help lighten the load on the other relievers — it’ll be that much easier for Boone to give someone like Betances or Robertson or Green that one extra day to rest, if necessary — and the cool thing is he’s coming with a relatively fresh arm. He missed all that time with the Achilles injury earlier this year, so he’s only thrown 15.2 innings this season (21 if you count his minor league rehab stint). This isn’t a guy who is 40-something appearances into his season, you know? July and August are when we start to see dead arm phases and things like that. Britton is, in theory, a long way from that. Everyone else — and by everyone else I mean pretty much everyone around the league, not just in the bullpen — really starts to feel it in August and September. Bats and arms are a little slower after the long season. Britton is going to be in something close to midseason form around that time, again, in theory. Maybe this doesn’t mean anything because he’s still shaking off the rust following the Achilles injury and long layoff. I like the idea that Britton didn’t have a big first half workload. He should be that much fresher late in the season. 5. I’ve mentioned a few times that I like adding Britton as Chapman insurance given his achy lefty knee, but he’s not just insurance against Chapman. Betances has a history of fading late in the season and Green isn’t missing as many bats this year as he did last year. Remember how good the bullpen looked on paper last season? Well, by time the postseason rolled around, it was Chapman in the ninth, Robertson as much as possible, Green every so often, and oh thank goodness Tommy Kahnle turned into 1996 postseason David Weathers. Betances was unusable and Warren didn’t have enough time to get going after his late season back injury. If anything like that happens again, Betances collapsing or someone getting hurt, the Yankees are better able to absorb the injury because they have another really good reliever. Hopefully everyone stays healthy and effective. That would be awesome. This is baseball though, and the odds are always against things going according to plan. The bullpen is now in better shape to overcome anything that goes wrong. 6. I totally expected the Yankees to net some international bonus money in the trade. The Orioles usually give it away because they ignore international free agency — the Yankees made two small trades with the O’s for bonus money last year — but nope. No bonus money. Supposedly the Orioles are going to revamp their front office and player development systems, and reinvest in international free agency, so I guess that’s why they held on to that bonus money. Then again, look at Baseball America’s international signing tracker, and there’s nothing for the Orioles. Not one player signed since the signing period opened July 2nd. How does a team operate like that? Well, whatever. I thought maybe the Yankees would get some international bonus money in the trade, but no luck. The O’s are saving it for something else. 7. Your opinion of the trade likely depends on your opinion of Tate. Carroll is a fairly generic hard-throwing Triple-A reliever with high strikeout and walk rates — I thought the Orioles would bring him right to the big leagues, but they sent him to Triple-A — and Rogers is more Vidal Nuno than Jordan Montgomery. A nice depth piece and that’s probably it. As for Tate, if you think he’s a starter, it’s a pretty good trade for the Orioles. If you think he’s a reliever, then it’s not so good. I’ve said this a few times in DotF throughout the year, but Tate’s strikeout (21.9%) and swing-and-miss (11.2%) rates are underwhelming for a guy with his stuff. Keep sending him out there as a starter, for sure, but he’s looking more and more reliever-ish as time passes. Potentially a good reliever! But a reliever. It seems really unlikely he’ll ever live up to the hype of being the fourth overall pick (and first pitcher taken) in his draft class. (Speaking of that, there can’t be many guys taken in the first five picks of the draft who were traded twice before making their MLB debut, can there?) If Tate is going to start long-term, he still has some development ahead of him, and the Orioles have been just awful at pitcher development the last two decades. Maybe he’ll be the guy that helps them turn the corner.